Rock Gardens….and my dad’s aching back! When I was a little girl my parents loved to go for drives and road trips. 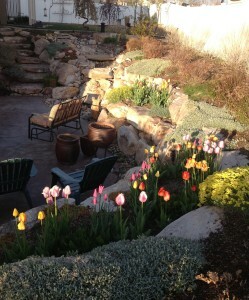 One experience that was always included was time spent looking for rocks for my mom’s rock garden. I don’t mean just little ole’ every day run of the mill rocks; I mean large and very beautiful rocks. My dad would stop at mom’s “request” and the two rock hounds would march out into some field or wooded area in search of the rock that would inevitably end up under my feet in the back seat of the car. Fun memories! WOW! Would I love to have some of those rocks now. Included in many were fossils and petrified wood. Well, we would get home from the trip and next up was (and this still brings a very big smile to my face) mom orchestrating dad around the yard to place the new find in EXACTLY the right spot. It always took no less than 6-7 moves. Keep in mind these were very HEAVY souvenirs! Well anyway, they ended up with a beautiful collection of mini-boulders for a fabulous rock garden. Unfortunately, however, they planted tams between the rocks rather than beautiful, flowering, creeping ground cover and some well-chosen perennials. Now, don’t get me wrong, tams have their place, but eventually all these beautiful rocks were completely covered with these evergreen shrubs. What a waste! And these bushes claimed many of my tennis balls and badminton birdies as well! 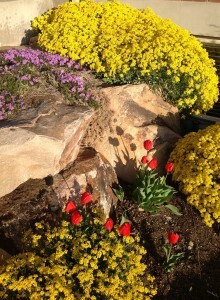 We, too, have some beautiful rocks (which we paid dearly for, by the way, and one reason I would NEVER want to cover them up), and a favorite hobby of mine is to try different flowers/ground covers, etc. 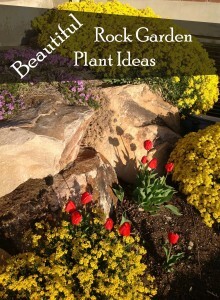 to plant in and around these natural sculptures.